Bringing up children is a relentless task and often there is no one we can ask for advice. Dealing with issues such as temper tantrums and deep rooted anger can be especially difficult and can push us to our limits of both our own temper and our distress at seeing our child behaving in this way. On some occasions trying to talk a child down from a temper tantrum will not be effective as the child is so wound up that they won’t listen or comprehend what you are trying to convey. In these instances it is often best just to let the child ride out their current tantrum somewhere quiet and safe. When you are out in public, simply take the child to a quiet corner and tell them that you are going to leave them until they have calmed down. Walk a few steps away and don’t give them too much attention. Never leave them alone in public but try not to crowd them a this may fuel their aggression.If need be restrain them gently while you are moving them by taking a firm but not damaging grip until you have situated them away from the centre of attention. When they have calmed down tell them that their behaviour during their tantrum was not acceptable and that they will be put in time-out if it occurs again. Children can experience tantrums throughout the first few years of their life and often parents must simply bear with them through this time. Try not to continually draw attention to their bad behaviour, but focus on the good and reward this with small treats and praise (sticker charts work well with a known target when the chart is complete).If however your child is having frequent and worsening tantrums in which they run the risk of damaging themselves, others or property it may be time to call for professional help. Speak to your health visitor or GP who will be able to refer your family for a behavioural assessment and try and determine the root cause of your child’s troubles. Often the greatest lessons can be learned from the parents so if you behave badly they will copy you. Think of all the times during the day when you are irritated and feel yourself losing your cool; there are probably more times than you care to admit. It is how you manage your own anger that is important. If your child sees you slamming doors, banging down the phone or verbally disrespecting people they will assume this is how anger and frustration are supposed to be vented and will follow suit.Always remember when you feel yourself losing control that you may be being watched and the image of you losing your temper may stay in the memory of the child throughout their young life. 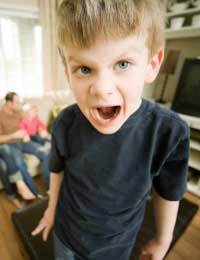 Managing your child’s anger can seem like an uphill battle for parents and their tantrums can leave you tired and exasperated. Consistency is often enough to help your child understand their behaviour is unacceptable and praising good behaviour seems to work better than continually punishing the bad.